Slow Cooker General Tso's Chicken - Who Needs A Cape? Who needs take out? Make General Tso’s Slow Cooker Chicken instead! 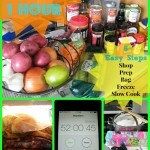 Part of our “7 Meals in 1 Hour” slow cooker/freezer meals post. We love Chinese food here at my place, but it’s definitely not the healthiest of choices if you’re watching what you’re eating. But, this version is made in the slow cooker instead, which cuts out a lot of the unhealthy stuff but still renders the kick that General Tso’s is known for. For a side dish, I didn’t have jasmine rice on hand so I instead boiled jasmine and green tea bags along with my rice to make my own jasmine rice, which complemented the chicken nicely. 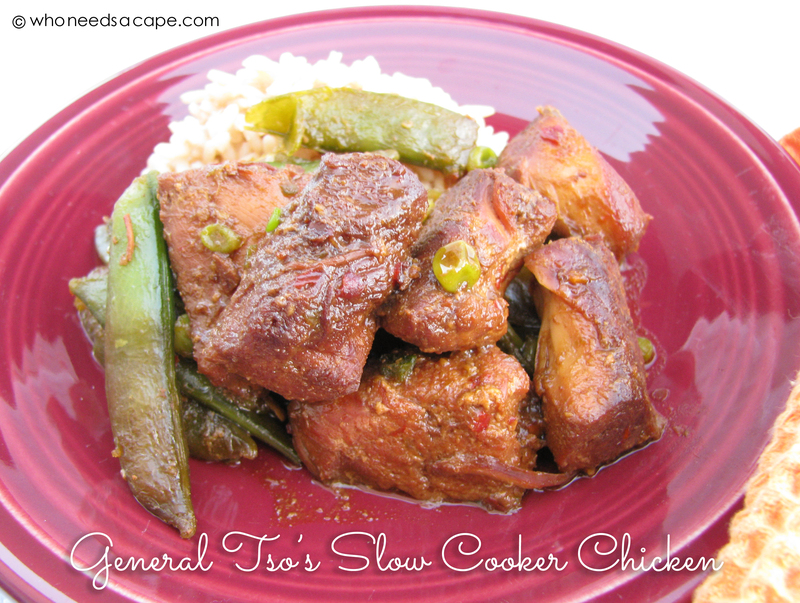 Hope you’ll give General Tso’s Slow Cooker Chicken a try – enjoy! 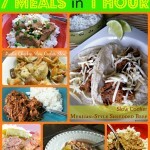 This dish is also part of our “7 Meals in 1 Hour” slow cooker/freezer meals post! Click HERE to see all the recipes! 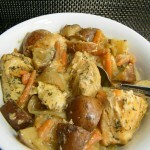 If using chicken breasts, cut into medium-sized chunks or strips (not too small); for other sections, use whole piece. In a bowl, mix remaining ingredients except for the peas. 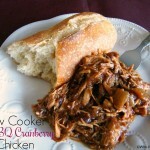 Pour mixture over chicken in slow cooker and stir. 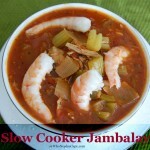 Cook on high for 3-5 hours (adjust according to your slow cooker's hotness if needed). During last half hour of cooking, add peas and stir to coat with sauce. Started this and found out I was out of honey. Subbing with applesauce. should be interesting. Mine came out a little dry. I wonder if my crockpot is the problem, and maybe I should have cooked it less than 4 hours. Is there a conversion to cook on low instead of high? I think my slow cooker is only 3 or 4 quart size. Do you think the 2lb top round roast from the mexican dish will fit?? Mary – Sorry not sure what recipe you are specifically talking about – I think this meal would fit into a smaller slow cooker – just not sure about a 2 pound roast – have never used a small slow cooker like that 🙂 Good Luck! My husband and kids don’t like snap peas, is there another vegetable you would recommend for this one? Thanks! Thanks for getting back to me! I will put it on the list! Fixed for a church group and it went over well. My only issue was the sauce, it was very thin. Is there any way to thicken? Also will add more pepper for spice, wasn’t as spicy as I like. You could try thickening with a bit of cornstarch or flour, I’ve done that myself. Thanks for stopping over.